Once again, thank you martha stewart. How can I have lived my whole life without knowing that you can boil the paint off stuff? Not that I've had a lot of occassion to put this tip into use, it still seems like something simple enough that should be common knowledge. 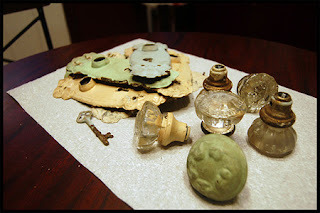 After much dremeling the paint off the screws, fiddling with too big screwdriver head to unscrew too small screws, prying plates and such, I was left with a nice little collection of doorknobs and plates from the 2nd floor. Got a pot (that will now be used for noxious chemical projects only), threw in some baking soda and set to simmer. Put in a few of the plates and crossed fingers. After about 30 minutes of simmering, the clear water was a mucky soup of blue, green and cream paint. I couldn't tell if it was working or not. I set up a workspace next to the stove of paper plates and paper towels to be ready to work fast on each piece before it cooled down. After fishing one out, the paint just slid right off with a paper towel and some running water! Magic!! It took a little handwork with toothpicks to get the stubborn paint out of some of the crevases. Now I have a bowl full of patina'd plates and knobs along with a new cooking skill. Sweet. postscript: Yes, I admit Im a fan of Martha. A big fan. Actually, Im more a fan of all the fabulous projects her staff do in her name...but I've got to give credit to the big M herself. So if you are a Martha hater, be warned - I will be mentioning various projects stolen from her media empire often. Sweet! I had *no* idea that could be done. Very silly that it's not more common knowledge. They're gorgeous!  Oh, and Mrs. Limestone, which lenses are you using to take these photos? Curious - I have a wide angle but it's definitely not the greatest. Im using a 18-55mm lens on the photos in this post...it one of the lens my camera came with. 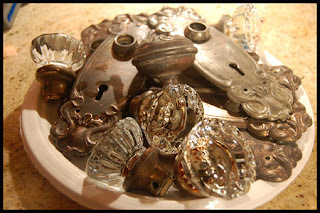 i love the patina on those doorknobs! i had a logon id but i can't remember what it is. nice work! 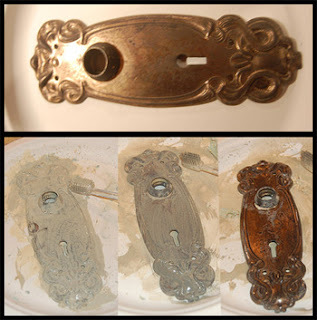 i remember my aunt and uncle boiling hardware that was on some kitchen cabinets in order to get some really old paint off. i thought it was a technique only for oil based paint though? Fabulous idea...thanks so much for sharing! I came over from the CSI project and I'm glad I did. Who knew you could do this??? What a fantastic tip and one that will definitely be put to good use with my many projects. WOW I have no idea you could do this!!! Awesome! How much baking soda? A dash, a couple of table spoons, half a box? I need to do this on some hardware in our 106 year old Foursquare. Thanks!! !